The 2005 vintage saw a fairly wet winter, followed by warmer-than-normal spring temperatures. The summer, in general, was a bit cool, though, and vintners were generally harvesting their Pinot Noir a bit later than they've been accustomed. 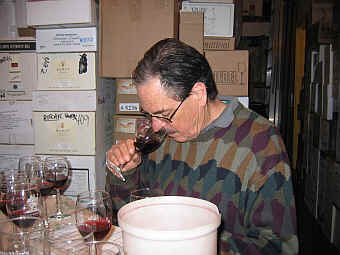 Some winemakers point to long "hang time" as a marker for quality. But a key question to the quality "riddle" is crop level. There was a tendency for the vines to set a larger-than-normal crop and so it was important for winemakers to manage the yield in the vineyards. We assembled a wide range of wines for this tasting. We had Sonoma Coast and Carneros in the north, down to Santa Barbara in the south. 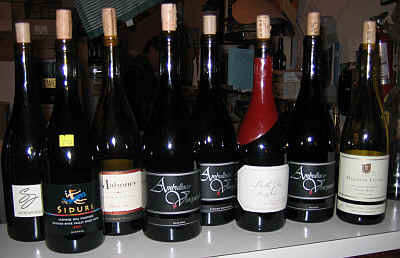 Prices ranged from about $36 on the low end to $120 a bottle on the high end. Despite such a disparity in price, the wines, for the most part, were rather close in terms of quality. 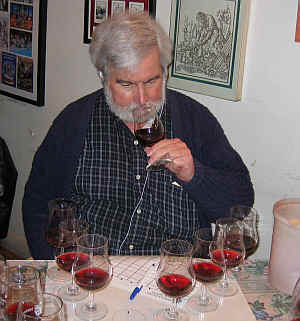 No wine was spectacularly superior to the others and, as a result, the distribution of scores was tightly bunched. The top three places were separated by a mere four points. The second tier wines, fourth place through seventh place, were separated by only 11 points. One wine was significantly buried in last place. This Pinot Noir specialist often gets good scores from the likes of Robert Parker's "Wine Advocate" journal and The Wine Spectator, but our group has yet to find a wine of especially great quality. 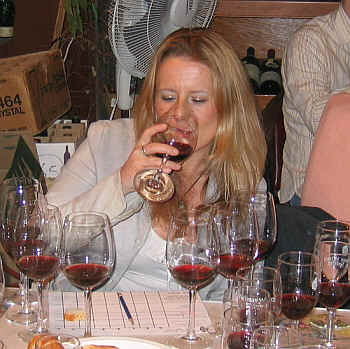 Many tasters were bothered by "off" aromas. One panel member felt the wine may be "spoiled," while another used the words "volatile and oxidized" to describe this wine. Another taster found it to have a "funky blast on the nose," while someone else detected a "tutti-frutti" element in this wine. One person found "root beer or cola notes," while other descriptors were "cat pee," "hibiscus" and "candied notes which reminded me of peanut brittle." One taster felt this wine "has so much sulphur dioxide that I still have a headache from sniffing the glass!" Another person found "barnyardy notes with decent fruit but a rather hollow finish." Someone else described it as having "H2S and mercaptans." A final voice mentioned "It's stinky, cloudy, flabby and sweet." Clear in appearance, this wine was the lightest in color of any in this set. 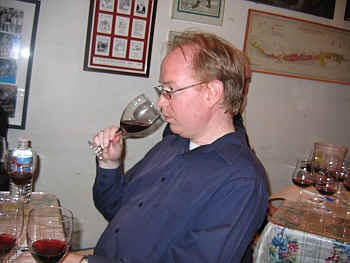 Light garnet color and this often is a major handicap to tasters who give more credit to darker-colored wines. I was not sensitive to the SO2 and odd elements other tasters encountered. I found a wine with lots of perfume and sweet cherry fruit. Vanillin...bright Pinot Noir aromas and a hint of mocha. I found the wine to be dry and medium-bodied. Unmistakable as Pinot Noir. Nice length on the palate, too. I gave it two stars on my three star scale, but I was the only first place vote for this wine. Your mileage may vary. With a bunch of first place votes, this wine also elicited a trio of last place tallies, which sank it in the rankings. One person found "Nicely intense nose and deep fruit. I liked the balance." Someone else described this as "having an interesting nose which reminded me a bit of asphalt. It's got a warm finish, too." "Best of the bunch!" announced a third critic, while someone else echoed this sentiment saying "It's the pick of the litter." Another taster found "Sweet blueberries, cola, cream and good acidity. There's a chocolate-cherry quality here, too." Someone else found a "cola note," while a more critical taster said it "lacks character and is a bit shallow." Having a clear appearance and a garnet color, this wine shows brushy, cherryish Pinot Noir fruit on the nose. I also detected a tea-like element towards the end of the tasting. I felt it was a good example of Pinot Noir. Dry, mildly acidic and with medium-light body, it's a nice, easy-going Pinot. There's a strawberry aspect to its flavors and some smoky notes and light tannins. I might mark it down for not being profound or long on the palate, but it's pleasant and well-made. One star. "It's reticent on the nose and it seemed to thin out on the palate over the course of the tasting." said the first critic. Another taster was more enthusiastic, finding it to be "complex and showing Asian spices." Someone else found "tart cherry fruit," while a final critic described this as "big on the palate, nice and clean and with lots of Pinot Noir character." "Seaweed and ocean-like fragrances were evident in this wine." said one taster. Someone else mentioned "Toasty notes on the nose with nice fruit. It's a bit tart, but has good length and some mushroom tones on the finish." A third person found "red currants and tart acidity," while someone else felt this was showing "raspberry essences and a Zinfandel-like character." Another panel member found "Cool climate Syrah elements in this lush, not-too-dense Pinot. It also has orange or citrus tones and some sweet and tart qualities." The Ambullneo philosophy is built on the notion of blending great vineyard lots of wines, so it's ironic that they've made a single vineyard Pinot Noir and priced it 50% higher than their already lofty-priced blended wines. I found it to be the least interesting of the three Ambullneo wines in our tasting, too. The wine is medium garnet in color and shows some toasty oak and mildly cherryish fruit on the nose. Dry and mildly acidic, this seemed a bit hot or coarse on the palate. Simple. Moderately tannic, the wine lacks the fruit intensity or finesse of grand Pinot Noir. The $120 price tag is ridiculous. I gave this perhaps a half-star rating. One taster described this as being "herbaceous," while another found it to have citrusy elements reminiscent of "grapefruit juice." 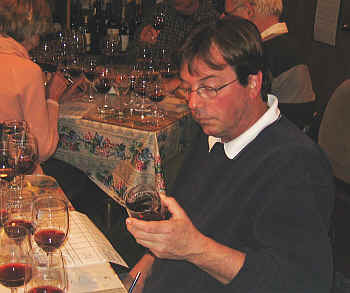 Someone else characterized the wine as being "low in acidity" and another taster found it to have "the most heat on the finish." Another critic knocked it for being "candied, sweet and reminiscent of berry jam." One critic described it as "sort of Burgundian, in that it may have had a cold soak prior to the fermentation. It's fat and a bit sweet." A final taster mentioned it was "tea like." Showing a medium garnet color, this wine offered a ripe fruit note with a floral aspect to its fragrances. There's a note of sweet cherry tobacco on the nose, as well. Elegant and refined on the nose, I thought the wine was dry and soft on the palate, with a "flat" point. It has some cherry pie-like flavors and a bit of berry-like fruit. One star. One critic found this to be "Zinfandel-like...it's sort of a chocolate milk shake." Someone else described it as "Super concentrated." Another critic found "Odd, cotton-candy aromas and it's rather bitter on the palate." 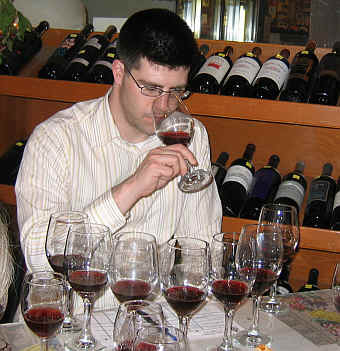 One fan found it to have a "deeper nose of Pinot Noir." Another person said "It has wonderful finesse in terms of the oak." One panel member found it "Sweet, syrupy and short." A final taster described this as having a "Bourbon barrel nose, a hint of Pinot Noir fruit and a hot finish." With a clear appearance and garnet color, this Ambullneo bottling offered ripe Pinot fruit and a mildly woodsy fragrance with faintly cherryish aromas. The wine is dry and mildly acidic with medium-full body. It's warm and mildly tannic on the palate, having a bit of cherry fruit. I felt the tannins were shrouding the fruit on the palate and the wine a bit hot, too. One star. "This was the biggest surprise of the tasting," said one critic. 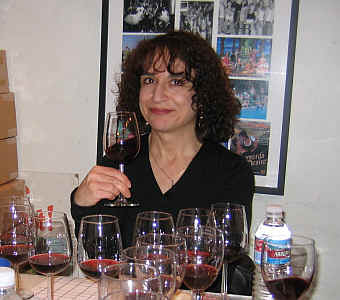 "At first I wondered where the Pinot character was, but it blossomed and came way up over the course of the tasting." Less thrilled was a panel member who found it to "not be very exciting and it's the most tannic wine with a very quiet nose." Someone else said it "Opened over the course of the tasting," while another person felt it "had no charm." One critic said "It'd be good house wine." A more positive voice described this as showing "rich spice notes and cardamom fragrances, with classic tomato stem aromas. It's a bit chalky on the palate with nice tannins." Medium garnet in color, I found ripe berry aromas and a hint of a plummy note on the nose. It's got a toasty, woodsy character along with some red berry fruit. Dry, medium acidity and medium+-body. There's a nicely berryish flavor and the plummy character comes through on the palate. Red fruits are plentiful here with nice oak and mild tannins. One-and-a-half stars+.